A musical project of maddening ambition unearths—and invents—a gay history of America. A loud and proud rebuttal of my younger self can be heard this month at the Under the Radar Festival at New York Live Arts in Chelsea, where Taylor Mac is staging the latest iteration of the mind-twisting rumination on musicality and gayness that he has been developing for several years and testing on stages around the country. It’s an expansive, malleable, and madly ambitious project called “A 24-Decade History of Popular Music.” The bland faux-encyclopedism of the title belies the radical strategy of the work—an intent, as Mac has put it, to unearth queer agency in the whole history of American pop. In each of the project’s various incarnations, Mac performs a selection of hit songs from a given time period. Two years ago, at the Public Theater in New York, I saw him do a show of music from the twentieth century. Mac has performed versions devoted to the music of the late eighteenth century and the hits of the nineteenth century. (Yes, there were hits—bona fide smashes—in the 1800s, sold by the millions as sheet music for an entertainment-deprived populace to sing and play on their parlor pianos.) At Under the Radar, Mac has been presenting a string of shows, beginning with a three-hour performance of songs from the first three decades of the twentieth century, which I attended. It will be followed by a three-hour presentation of music from the next three decades of that century, and both of those shows will be combined in a six-hour event to be staged on January 25. Mac’s plan is to have the series culminate in an epic twenty-four-hour performance of songs from the twenty-four decades spanning from 1776 to 2016, to take place at some point next year. Mac, who cites his gender as “performer,” does his act in a deliciously preposterous drag straight out of the Greenwich Village of the 1970s, when drag queens like Rollerena exploded the conventions of gender normativity in the name of shameless showbiz. 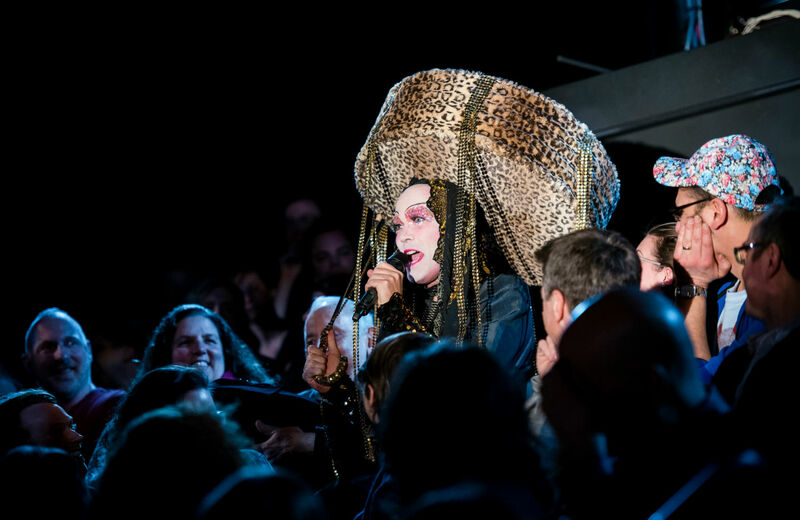 Mac’s stage persona, bedecked in grotesquely frou-frou gowns and headwear fashioned from ostrich feathers and party balloons, is a classical drag amalgam of old-Hollywood glamour, pissy queen schtick, and sly, winking intelligence. Mac is performing a character that would have seemed wildly subversive a few decades ago but now comes across as cutely, almost quaintly nostalgic.